February 26, 2014 – It’s been almost seven years since James Espey, Tom Jago, and Peter Fleck unleashed the original Last Drop blended Scotch from 1960 on the world. The men behind Johnnie Walker Blue Label, Chivas Regal 18, and other legendary blended Scotches pledged at the time that they would only release new whiskies when they found casks that they considered to be worthwhile. Since then, the only release from The Last Drop was a Cognac from 1950, and the original 1960 Scotch is now sought after by collectors willing to pay as much as £4,000 ($6,700) when a bottle comes on the secondary market. Now, they are releasing a 50-year-old blended Scotch whisky from the final remaining stocks of that whisky. In an interview with WhiskyCast’s Mark Gillespie, James Espey explained that they didn’t bottle all of the three casks that produced the 1960. 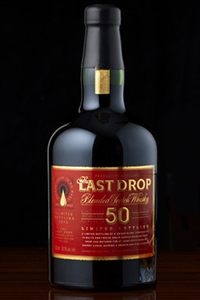 Only 338 bottles of The Last Drop 50 Year Old will be available in the UK, US, Hong Kong, China, and a few markets to be determined, with a recommended price of £3,000 ($5,000 USD) per bottle. In the US, Infinium Spirits will be the importer, and the recommended price is expected to be in the $4,000 range. We won’t have to wait another seven years for the next release from The Last Drop, though. Tom Jago’s daughter Rebecca has joined the company, and has identified a single malt Scotch whisky that will be released later this year.